Recently natural soaps have been making a comeback, as more Americans are diagnosed with skin sensitivities and conditions. While many major brands have begun manufacturing "natural" or "botanical" versions of their soaps, there’s little understanding of what sets these soaps apart from the regular commercial varieties. In many cases, there’s little actual difference between these soaps. Therefore, consumers looking for fragrance free, dye-free, SLS-free or chemical-free soaps should opt for pure soaps (also known as castile soaps) instead of commercial varieties of soaps. Unlike commercial soaps that rely on SLS (sodium lauryl sulfate) to create a soapy lather, castile soap's bubbles come from saponins in the oils that are released from the reaction of lye and oil. Many skin irritations like itchiness, flaking, and redness are a result of dry skin. In the commercial soap making process glycerin is removed from the oil used to make the soap so that it can be sold for more expensive applications (facial creams, cosmetics, etc.). This glycerin is what provides moisture to your skin. When pure soap is made all of the glycerin is retained so all of that moisture stays in the soap- allowing your skin to be hydrated with every use. With the moisture content so much higher, pure soap can even be used on babies and children. Pure soap actually opens pores, unclogging them and allowing for a deeper clean. Subsequently, people with severe acne have reported that using pure soap has allowed for their pores to be gently unclogged- reducing acne breakouts and the occurrence of blackheads. Pure soap can actually accelerate skin’s natural healing properties- allowing for scars and stretch marks to become less visible over time. People with eczema, psoriasis, dermatitis, and SLS-sensitivity have a hard time finding skincare products that won’t irritate their skin or worsen their condition. Pure soap is the best solution for these conditions or sensitivities because it is very gentle on the skin and can greatly improve overall skin health. Commercial anti-bacterial soaps contain a chemical called triclosan, which is actually registered as a pesticide by the EPA. Triclosan can lead to endocrine system issues, birth defects, decreased fertility, a weakened immune system, and even cancer. Pure soap does not contain triclosan. Pure soaps are only slightly more expensive, and the high-quality ingredients used are pure and all-natural, whereas commercial soaps use low-quality ingredients composed mainly of cheap chemicals and additives. With all of the natural soaps out there, which one should you use? 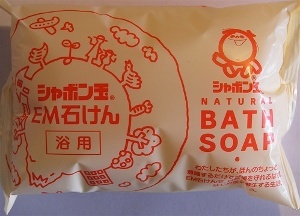 Our favorite pure bath soap is called Shabondama, which means "bubble" in Japanese and can be found on our website!